New! GRAND CRU, our most luxurious ampoule treatment ever. Contains 3 brand new precisely coordinated Ampoule Concentrates with exclusive rose extracts to create a highly effective and all-around radiant skin. Apply 1 Ampoule daily, after cleansing, for 7 days. The Grand Cru ampoules offer the ultimate anti-aging experience in 3 steps over 7 days. The skin is rejuvenated, refined and protected by the ampoule treatment in a 3-step system. 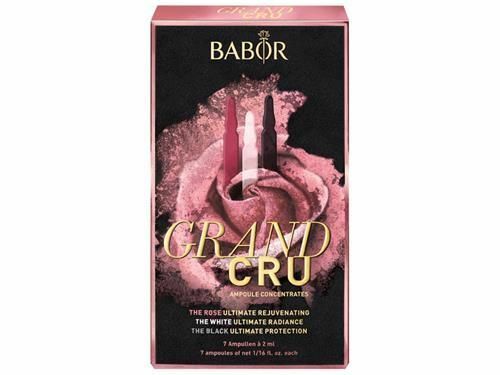 Step 1: GRAND CRU The Rose – ultimate skin rejuvenation Step 2: GRAND CRU The White – ultimate youthful radiance thanks to improved skin structure Step 3: GRAND CRU The Black – ultimate protection against premature, environmentally induced skin aging After cleansing with BABOR CLEANSING products. Shake the ampoule and cover the ampoule neck with a tissue or the enclosed ampoule opener. Hold the ampoule by the ampoule neck or opener and break it open with a sudden jerking movement on the lower, colored ring. Pour concentrate into the palm of your hand and work into face, neck and décolleté. Gently pat into the skin. Then apply skincare cream.